You Duvet to continue with this, on your own, have an unusual sense of humour and a true sense of let the past be the past. Perhaps you and people like you are the way forward ? I'm sorry but I am partial to Our Lady of the Blessed Baladi! All else is herasy! Our Lady of Egypt can be considered as Patron of Raqs Baladi since She is the Queen of Egypt !!! St. Catherine of Alexandria is also a good option though ! St.Catherine - a princess and scholar who refused to marry any man beneath her intellect, and so remained a virgin all her life. So far, so good. But then she was tortured on a spiked wheel and beheaded. Not so good for inspiring a performance piece. But she did give us the Catherine Wheel firework. Another Egyptian saint - Menas. Patron saint of camels. Someone to call upon during choreography crises, maybe? Last edited by Duvet; 06-13-2012 at 06:25 PM. Reason: added image of Menas & his camels. Our Lady of Egypt is the Best Patron saint since she's the Queen of All Saints !!!!! Maybe for some, but for others less Christian there is Nataraja, the Hindu Lord Shiva as the Cosmic King of the Dance. His dance is the source of all movement in the universe; bringing the creation, sustainment and destruction of all things. Dancing encompasses the universe, but is at the centre of the heart. Dance connects the dancer with the oneness of God and creation, releasing the soul from illusion. Crotus, inventor of the hunting bow and the rhythmic beat of music. He was a son of the god Pan (himself a great dancer), and accompanied the Muses on Mount Helicon in their sport and play. On his death he became the constellation Sagittarius, the archer in the form of a centaur. If you’re into latromathematics (that’s posh for medical astrology) Sagittarius rules the thighs and hips. So, rhythmic beats with thighs and hips - sounds like the start of a choreography. 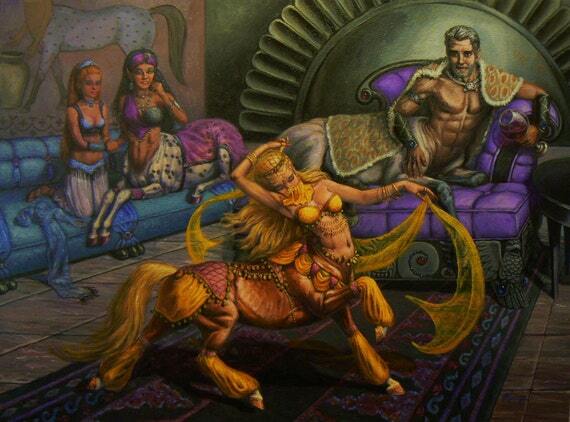 Although as a centaur he did have two left feet! Last edited by Duvet; 03-03-2018 at 10:28 AM. Ever watched a choreo-manic performance where you prayed it would end? Well, you’re in good historical company. During the Middles Ages in Europe there were sporadic outbreaks of uncontrollable dancing in the populace, the cause of which is still debated today. 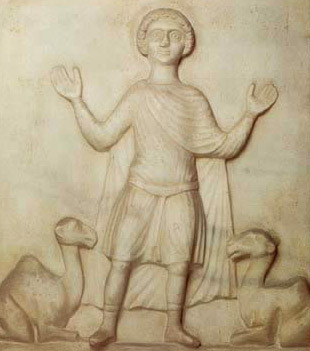 These ‘dance-manias’ were later known as St. Vitus Dance, but an earlier reference to them was as St. John’s Dance, and prayers were given to St. John the Baptist to cure participants of this affliction. St. John the Baptist was not himself the patron saint of dance, but he was closely associated with it in the minds of many, for not only was he a protector against epilepsy (and hence all uncontrollable body movements) but he was also beheaded as a consequence of the dancing of Herodias’ daughter, and so was quite likely to be conducive to seeing any dancing stopped. St. John the Baptist is coincidentally the patron saint of the Roman Catholic Diocese of ‘Charleston’, South Carolina, which gave its name to the 1920s dance craze. Looks great fun; wish I’d been there. Bes - Egyptian god of dance. He was also a god of war, in that he was a protector of the Pharaoh and the people, and protector of the home, of pregnant women, and of young children. If a baby laughed or smiled for no reason, it was said that Bes was pulling faces at the infant. He was also the god of humour and music, portrayed as a bow legged bearded dwarf with his tongue stuck out. He would also be shown playing various musical instrument, or dancing. The island of Ibiza, known for its nightlife and nightclub dancing, is, appropriately enough, named after him. Bes would certainly get your dance party going! Although associated with the goddess Hathor (due to her similar attributes of childbirth, music and dance), Bes' wife was often identified as the goddess Taweret, who, like Bes, was a protector of pregnancy and childbirth. She was depicted as a hippopotamus with a crocodile on her back, or as a hippo/croc composite. Last edited by Duvet; 04-15-2015 at 11:13 PM. Years ago to help me with my dancing I purchased a silver Sri Nataraja and still wear it when I am dancing and because I am used to it I wear it most of the time now, it strung on a Indian silver snake chain I have worn for years, well, since '98. Shiva Nataraja danced the world into existence- Lord of the dance.